The Bulk Actions feature provides you with the tools to easily perform bulk updates to your user list. 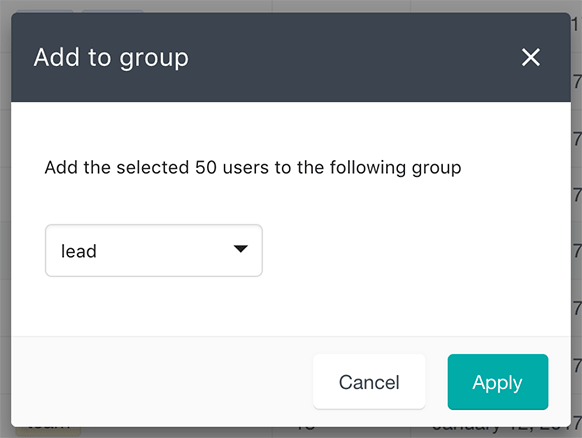 Instead of individually selecting a user and adding the user to a user group, you have the option to assign a user group to a selection of multiple users at once. This makes the process a lot quicker and easier. With the bulk actions feature, there are two different ways to select multiple WordPress users. You can either select the users individually or select all the users on the current page. To select the users individually, just hover the avatar image of any of the users that you would like to update. Hovering the avatar will replace the avatar with a checkbox that you can check. Once at least one of the users has been selected, the rest of the user avatars will automatically turn into checkboxes that you can also check. To select all the users on the current page, just click on the checkbox that is located in the username heading of the table. This will automatically select all the users who are currently available on the page. Please note that if you switch the page, the selection won’t be saved. The bulk actions are only available on your currently active page. After selecting the users that you wish to update, you can choose which action to apply from the “Bulk Actions” menu that is located above the user table. At this point the “Add to group” and “Remove from group” actions are available. Once you select the action, a dialog will be displayed where you can choose which group you would like to update for the currently selected users. 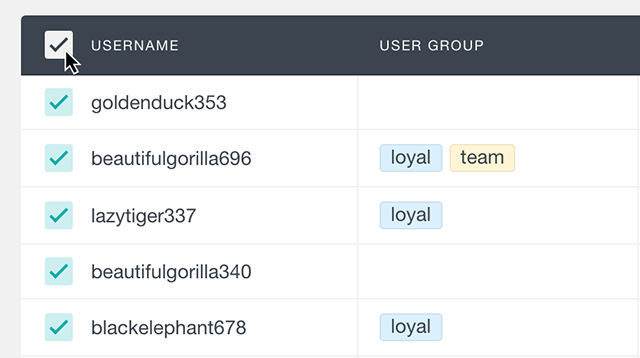 By combining the bulk actions with the smart filters you can create custom user groups and bulk add users to a group if they fulfil a certain criteria. There is a large range of filters that are available and you can combine them in the way you like. Once you have the user segment that you need, you can just use the bulk action to add (or remove) all these users to a custom user group. If you want to remove all the users from a specific group you can easily do it by combining the bulk actions with the Users Insights smart filters. First, you need to apply a filter “user group is” and select the user group that you want to remove all the users from. This will filter your user list and show only the users who belong to this group. After this, just select all the users from the page, click on the bulk actions menu and choose the “remove from group” option to select the group from the list. This action will remove all the selected users from the group and refresh the list. Now you just need to repeat the process for the rest of the users from this list.